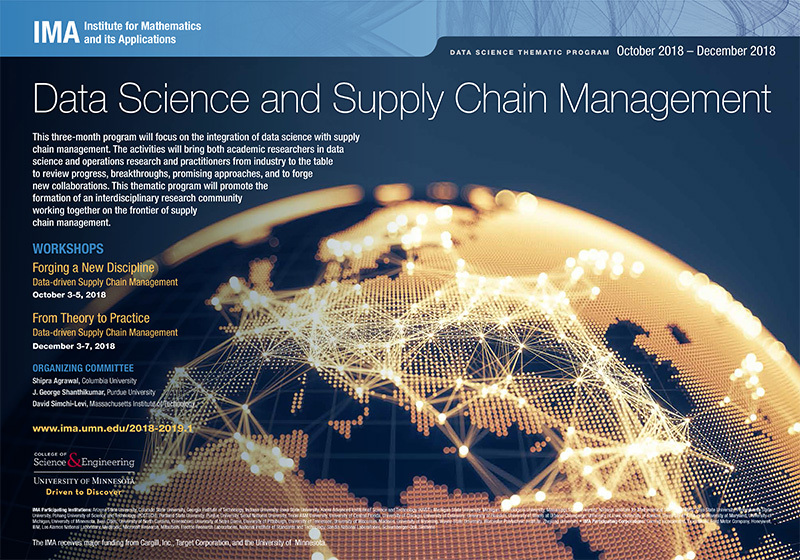 This three-month program will focus on the integration of data science with supply chain management. The activities will bring both academic researchers in data science and operations research and practitioners from industry to the table to review progress, breakthroughs, promising approaches, and to forge new collaborations. This thematic program will promote the formation of an interdisciplinary research community working together on the frontier of supply chain management. The program will start with a three-day workshop that aims is to bring researchers from academia and industry together to define research directions and to set goals for the program. A five-day workshop is planned at the end of the program where progress made and discoveries will be discussed in depth. Between the workshops, the IMA will host visitors including young researchers to collaborate on projects. Applications for long-term visits will be considered on a rolling basis. Please apply through the general membership application. These researchers will have an opportunity to present their findings in the second workshop. For shorter stays at the IMA, participants are encouraged to form working groups and apply through the data science working group form. The IMA gratefully acknowledges Cargill, Inc. and Target Corporation for their generous support of this program.